You just hit save. Duh. Actually saving a video in Cinema 4D isn’t quite that easy, but it isn’t daunting either. In this article, we are going to discuss two ways to render a video out of Cinema4D. The first is really straightforward, but you’re racing against the odds to have a crash and lose all your work. The second will save you hours of frustration in the future, but it involves an extra step. A little warning, this article assumes you have opened Cinema4D before. If you're new to C4D eep your eyes peeled for Cinema4D Basecamp coming soon or go check out GreyScaleGorilla. You’ve got your scene set up. It looks fantastic. Now, you need to do some more work with it either in Adobe After Effects, Premiere Pro, or possibly even Nuke or Fusion. Maybe it isn’t any of that. Maybe you’ve got an Instagram following that you’ve been doing daily renders for, but never actually rendered out a video. Cinema4D has you covered. Step 1: Go into your render settings. There are three ways to get to your render settings. Click on the “Render” menu, and scroll down to “Edit Render Settings”. Use the shortcut Ctrl+B (PC) or Cmd+B (Mac). Click the render settings icon. Step 2: Check Yo' Render Settings. Step 3: Straight to video. In your render settings, hit the check mark on “Save” to tell Cinema4D you are ready to render your scene to a file. Under “Save”, you’ll get a few format options. Everything from a .png to an .mp4 video. Choosing MP4 will be the most straightforward way to render your Cinema4D scene to a video, but just know that you can export a lot of different formats in C4D. Just as easy as 1, 2, 3, MP4. If you’re lucky enough that Cinema4D didn’t crash during your spectacular 1000 frame master piece, congratulations! However, crashes happen no matter how solid Maxon develops Cinema4D. Complex scenes take a lot of power to render, and rendering straight to video is a sure way to lose your render. The best way to combat that is through rendering an image sequence and processing that sequence into a video. Imagine an image sequence like those doodles you would do as a kid in the corner of your notebook. Each page would have a slightly different image to create the illusion of movement. Also known as, animation. This is the same for film, TV, and everything you watch on a screen. It is actually a series of images that are being played back at a rate in which the eye perceives movement instead of a still image. Choosing to render an image sequence out of Cinema4D allows motion designers and 3D artist to hedge their bets on a crash happening. In the event of a crash, the user can restart an image sequence render from where it last left off and not lose everything the way one would with rendering straight to a video format. This does mean there are a couple more steps. Similar to rendering a video, you’re going to repeat all the same steps, except you can jump to step three. You can jump to step 3. This time, under your “Save” options, you’ll want to choose an image format. That means a .png, .jpg, .tiff, etc. It is a good idea to choose a folder location dedicated to catching all the images that Cinema4D is about to render out. If you have a very long scene and don’t choose a dedicated folder for the sequence, you’re going to weep over the mess you’ve made on your hard drive. Never put final in your file names. Alternate Step 4: Use Adobe Media Encoder to Transcode the Image Sequence. Most motion designers are working with Adobe’s Creative Cloud suite, and as long as you have Adobe After Effects or Premiere Pro installed, you can install Adobe Media Encoder for free. If you're not using Creative Cloud and are without access to Adobe Media Encoder, you can use an awesome free software called Handbrake. In short, transcoding is taking one video format and converting it to another video format. Sometimes this is necessary because a client cannot read ProRes or the 4K RAW file you received slows down your computer too much. For this purpose you'll need to transcode your image sequence to a video file. If you’d like to learn more about transcoding, check out this article. A day in the life of a transcoded video. We’ve covered Adobe Media Encoder in some other articles, but have no fear! It is so simple that you can do it with a couple clicks. 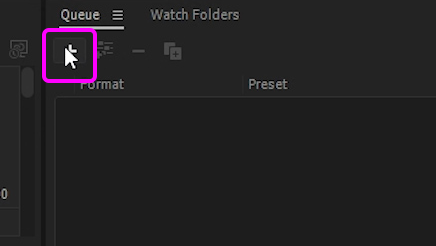 When Adobe Media Encoder opens, you’ll see a plus sign to add your media. Go ahead and press that button and find the image sequence you just rendered. Adobe Media Encoder will automatically assume that you want to transcode that sequence. Right now you could hit the play button and render out a transcoded version of that file and be on your way. However, take a moment and choose whatever format you’re looking to export this as. For social media, I recommend the .mp4 format because it compresses to a nice size while also holding up its integrity quite well. Now, go get a beer. You deserve it after learning two ways to render out a video from Cinema4D.